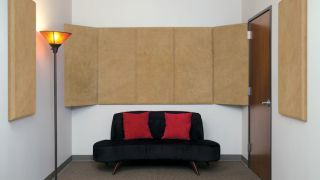 The What: Auralex Acoustics is now shipping its expanded line of ProPanel ProKits acoustical room treatment systems, now offering a total of six fabric choices. ProKit-1 and ProKit-2 room treatment systems are now available in four SonoSuede fabric choices: red, black, tan, and brown; as well as the standard fabric colors, sandstone and obsidian. The What Else: Both kits include 2-inch by 24-inch by 48-inch beveled wall panels and reverse mitered corner bass trap panels to provide low-frequency absorption, critical in small to medium-sized rooms. All mounting hardware is included. Additional ProPanel Cloud and monitor isolation solutions are also available.